Fruit Shop is one of Net Entertainment’s more popular titles, and over the years, millions of players have enjoyed the simplicity of a modern-day Video Slot, combined with a sense of old-school gaming (think Las Vegas machine style). Due to the success of the original Fruit Shop game, Net Entertainment decided to release a special Christmas edition, eloquently titled; Fruit Shop: Christmas Edition – and while the game is “identical” … there are a few subtle differences. First off, let’s look back at the original slot. Fruit Shop (and indeed the Christmas edition) uses 5 reels, and 20-paylines to deliver a standard Net Entertainment gaming experience to players. The symbols on the reels are a mixture of traditional playing card symbols, including 10, J (Jack), Q (Queen), K (King), and A (Ace), and fruits, and the fruits include Cherries, Plums, Lemons, Oranges, and Watermelons, with the low-paying being Cherries, and the high-paying being Watermelons. The game is simplistic, and both editions run perfectly on most mobile devices. iOS, Android, Blackberry, and Windows device owners should have no issues accessing the game, provided the device is relatively new (last 5 years), and a working Internet connection is present. Alright, so, so far, all seems fairly similar; where Fruit Shop: The Christmas Edition differs, is in the design. The reels and backdrop are covered in a heavy lair of snow, with the symbols edited accordingly, to give a chilly, wintery feel to the game. The musical soundtrack and in-game audio effects have also been edited, to coincide with the new Christmas theme, and while it’s nothing particularly ground-breaking, Net Entertainment have done a decent job at adding a Christmassy touch to the original. 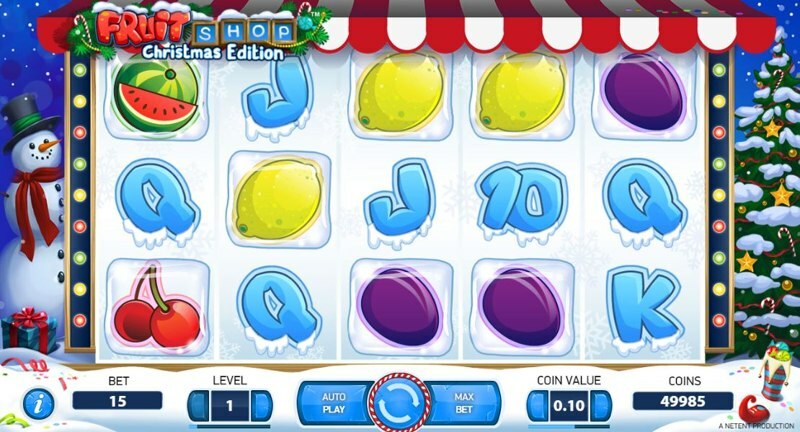 Like the original Fruit Shop game, Fruit Shop: The Christmas Edition doesn’t feature a bonus-round “per se”, but does have a free-spins feature, which is unique, and not typically something players are going to be familiar with. 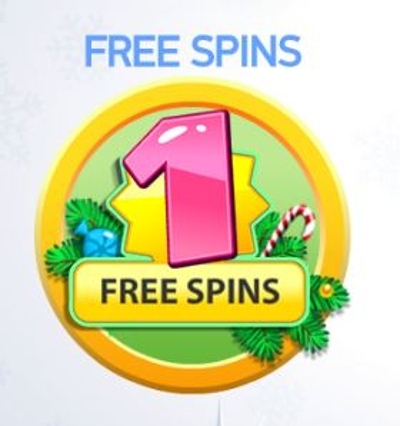 If you manage to land certain combinations of fruit on a winning pay line, you instantly enter the free-spins feature, and while this sounds a little strange, let us explain! So, with Cherries, if you land 2, 3, 4, or 5 of them on a winning pay line, you’ll receive 1, 1, 2, or 5 free-spins respectively. The next fruit, Plums, awards 1, 2, or 5 free-spins, for landing 3, 4, or 5 of the symbols on a winning pay line, with Lemons, Oranges, and Watermelons all using the same format to dish out free-spins. During the Diamond Storm, all wins are subject to a 2X multiplier, and you can easily re-trigger more free-spins by simply landing more fruit on a winning pay line (although you can only re-trigger using the fruit you originally entered the feature with). It sounds a little odd – and perhaps confusing – so it’s best you go and check it out for yourself, to see exactly how it works.